The best-laid plans of mice and men are no match for Neptune. Such was the case Monday morning, when the wind died just as we needed it to fill in. 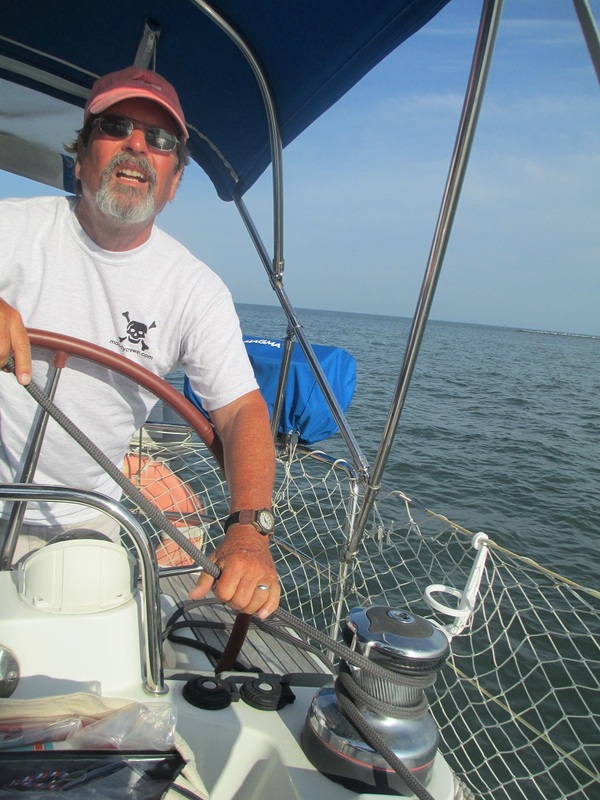 An hour earlier, the TALL SHIPS CHALLENGE® Race Team had boarded local sailor Paul’s 45’ sailboat with Tall Ships® at Cape Charles Port Organizer Capt. Dave Steward, his wife Hania and her daughter Kim, photographer Chris Glennon, and Paul himself. Picton Castle was pushing off the dock as we let go our lines and, a few finger piers away, Lynx was preparing to get underway. We were following Picton Castle out of the harbor entrance and had just rounded the turn into Cape Charles Harbor Channel when the engine on our race committee boat sputtered smoke and failed. 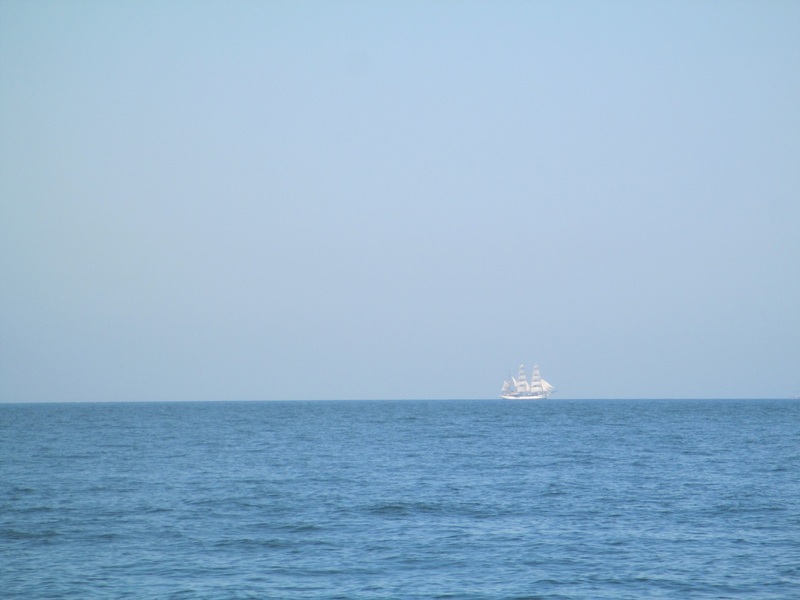 We were dead in the water and, after some discussion, hurriedly set sail while Lynx motored past. Serenity approached as we cranked in the jib and hauled up the main sail. The light breeze caught our sails and enabled us to maneuver back into the channel under sail power. Hindu passed us as we gybed around and Tree of Life followed shortly thereafter. We were now last in the fleet, tacking our way slowly down the channel, ducking the numerous lobster pots and eyeing the charts for shoals at the channel edge. We let the ships know that the race start would be delayed as we were now relying on wind power to reach the distant start line. The sun was hot, the water calm – nearly a perfect morning for a sail into the bay. But despite the button-operated auto-furling sails, the digital depth sounder, and the bimini providing us with shade, technology and time have yet to conquer one thing – a dying breeze. The wind is less than ten knots and dropping. 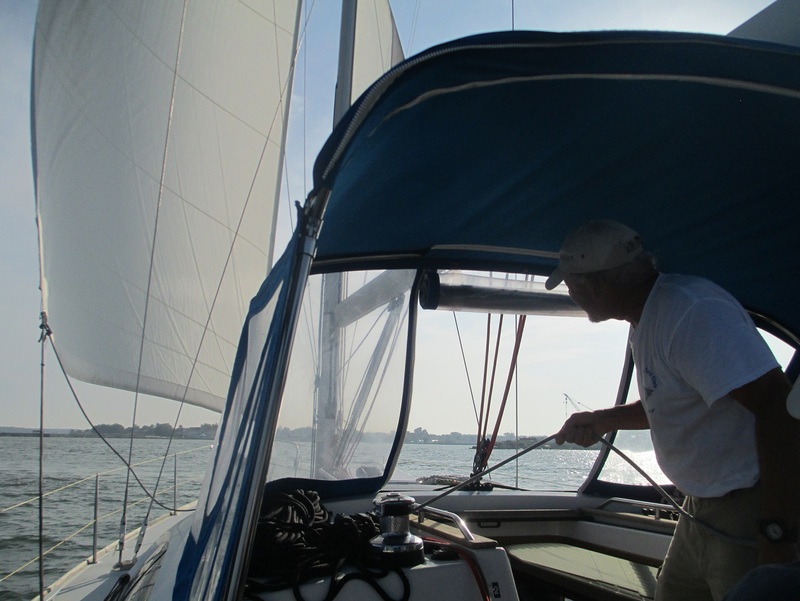 We trim our sails and float along at two knots. Having lost our engine at R “8” (the red buoy number eight), we cheer when we finally pass RN “6”. 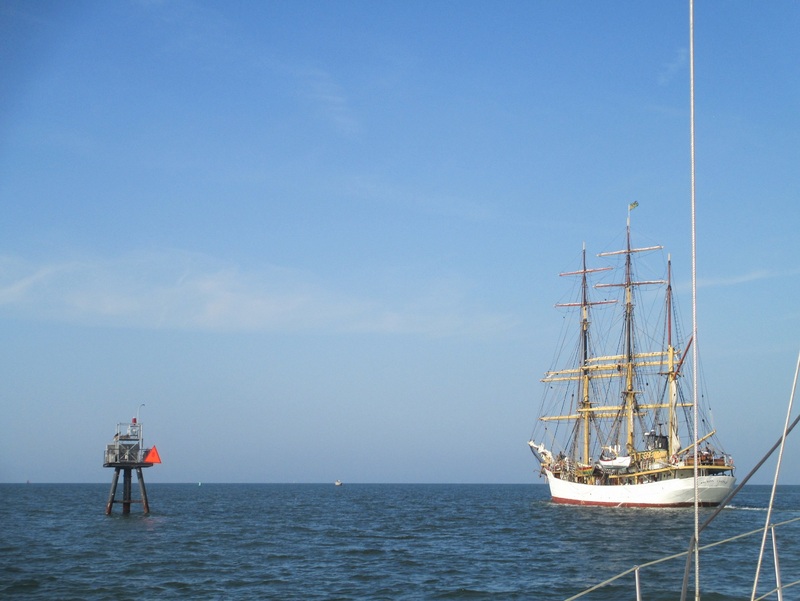 Picton Castle, far in the distance, exits Cherrystone Channel and begins to set sail. 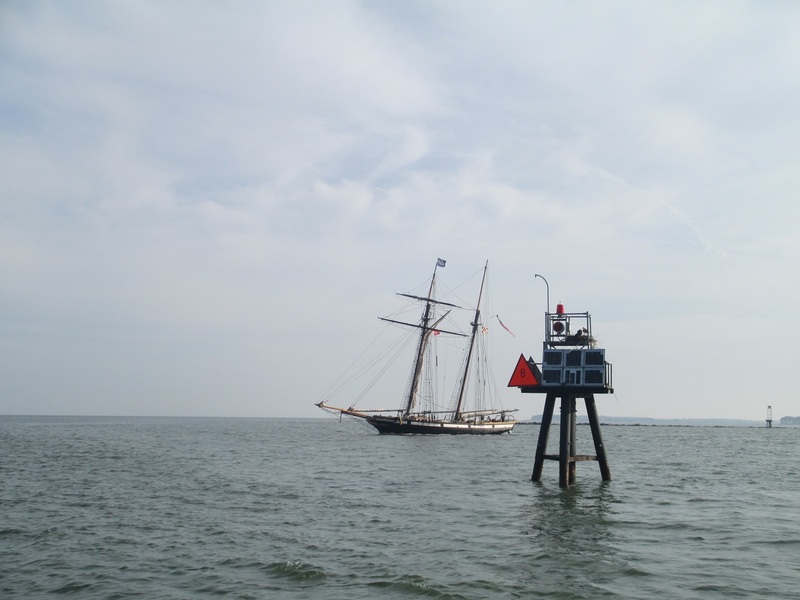 The four schooners are close behind, visible by their white sails gleaming in the summer sunshine. The breeze freshens for a short while and we breathe a sigh of relief. If we can only pass R “4”, we can duck out of the channel and cut across the 12’ shoals towards the starting line. But we make little headway before our boat speed drops from two nautical miles per hour to one. The wind that we so need is barely holding steady at five knots. The current is against us, hindering any momentum we can muster. We radio the ships. The radio crackles and we hear Captain Josh, of Hindu, talking to the fleet. “Does anyone want to start racing from where we are?” he asks. From our vantage point near shore, we watch as the five vessels sailing along the horizon alter course and adjust their sails. Although we are too far away to capture photographs of the vessels under sail, crew members on board the ships are happy to let us live vicariously and text us photo updates as they race and cruise in company. 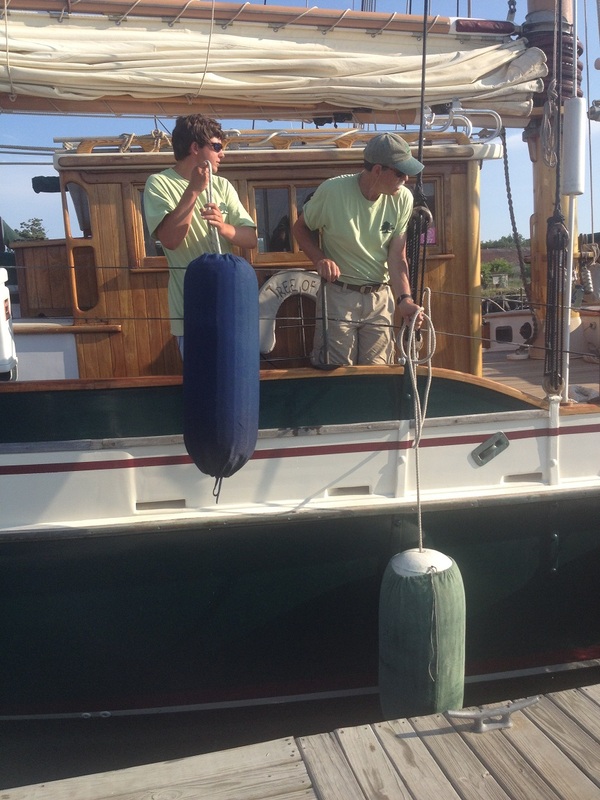 Strong Medicine turns towards the harbor and skippers Paul and Dave let the current push us up the channel. It is swift and, within twenty minutes, the dock looms ahead. As Erin and I clamber over the rail, we glance out towards the horizon one last time. The ships are almost out of view: one is homeward bound, another is making for the Chesapeake & Delaware Canal, and the others are seeking a sound mooring so as to enjoy the beauty and relative peace and quiet of the sheltered bay. Fair winds, sailors. 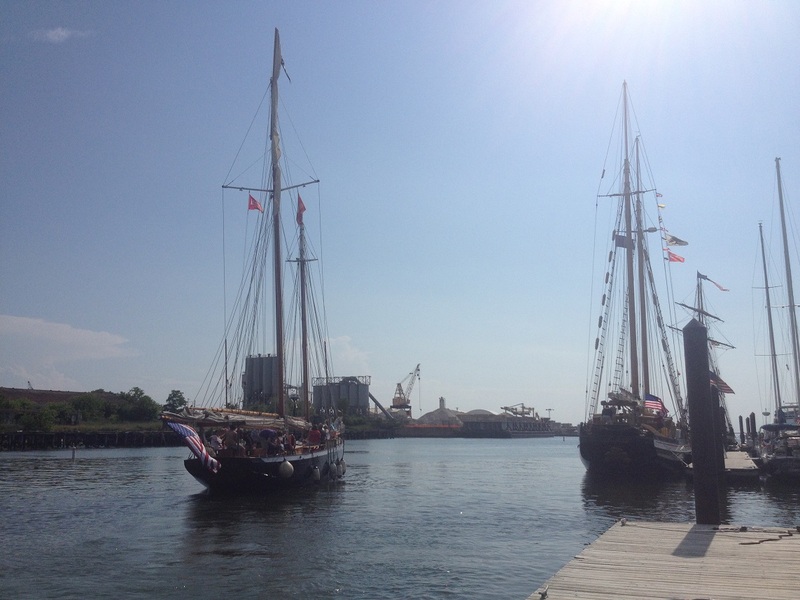 We look forward to greeting you at the dock at Tall Ships® Philadelphia Camden! 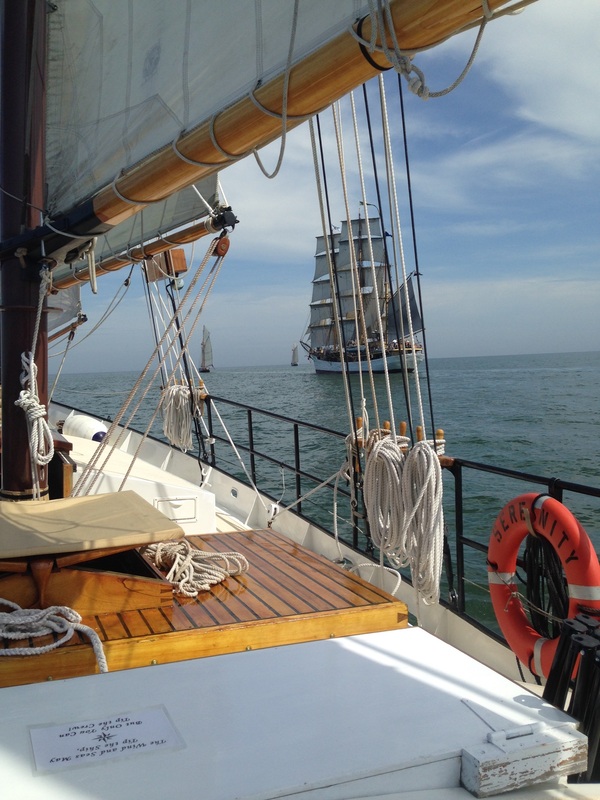 This entry was posted on June 19, 2015 at 9:30 am	and is filed under 2015, TALL SHIPS ATLANTIC CHALLENGE. You can follow any responses to this entry through the RSS 2.0 feed. You can leave a response, or trackback from your own site.